An Essay on the Principle of Population. Thomas Malthus. Penguin Classics, 1970, pp 291. 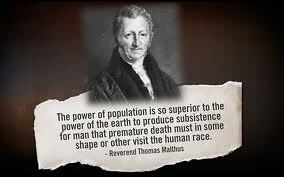 Thomas Robert Malthus was born in 1766. After schooling, he had a brilliant academic career in philosophy and science in Cambridge. He later became a priest in the Anglican Church, a profession which allowed him time to read, write, correspond widely and travel. He published his first book on population An Essay on the Principle of Population in 1798 and subsequently he published five further editions up to 1820 and a summary of his views, including additions and emendations, entitled A Summary View of the Principle of Population in 1830. He also published several other works on political economy and social philosophy. No work, apart from Darwin’s The Origin of Species, received so much attention, both approbation and criticism, as this first essay, and both Darwin and other evolutionists acknowledged the considerable influence Malthus had on their opinions and conclusions. By 1820 a bibliography of titles dealing with his views on population required more than 30 pages of text. The substance of Malthus’s writings was based on his belief that every animal species, including man, will increase in numbers by geometric progression every generation if they exist in an optimum milieu where checks on survival do not exist. Geometric progression implies doubling in numbers every generation (1,2,4,8,16 etc). An optimum milieu exists for humans in the absence of civil strife and war, of the epidemic diseases and providing there is adequate nutrition for the entire index population. These are the positive factors which are consistent with optimum survival. He also wrote about preventive factors which adversely influence population growth. They include sexual restraint, celibacy, late marriages, infanticide, poor community organisation, and factors described by him euphemistically as ‘corruption of morals and vice’ which apparently include contraception, abortion, homosexuality, sterilisation and ‘illicit’ sexual activities. He did not envision the prospect of the current many extra-marital births and he believed that sexual restraint was the only method of control consistent with virtue and happiness. There is a logical basis for his population hypothesis and he provides a number of circumstances during the 18th century where the population under appropriate conditions increased close to the point of geometric progression. The white population of the American Colonies was one and he quotes Humboldt who reported a doubling of the population in South America every 27 years. 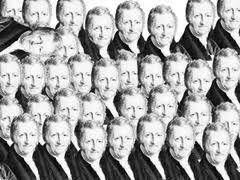 In the summary of his writings published in 1830, Malthus refers to the population increase in Ireland from an estimated one million in 1695 to 6.8 million in 1820 (and close to 8 million at the time of the famine in 1847). There were other isolated examples in Europe where he credits such increases. He believed that population increase depended on a corresponding increase in food supply but, because of the limitation of arable land, the finite space on the planet suitable for agriculture, crop failures and soil exhaustion, his concern led him to believe that food production could only increase at the most by arithmetic progression (1,2,3,4,etc). He undoubtedly underestimated the increasing productivity of food which we have seen since his time through science and globalisation. However, it is certain that eventually there must be a final limit to food production if the human population continues to increase at its present rate and if our environment deteriorates, particularly as it is unlikely that problems of distribution can be easily solved. 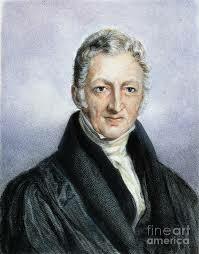 Perhaps more important than the influence of food production, it is understandable that Malthus could not have anticipated the adverse effect an increasing population has had on the environment. Our wellbeing and even survival must be affected by climate change, shortage of fresh water, the dwindling of lakes and glaciers, the invasion of alien species, over fishing, the destruction of rain forests, and the continuous loss of many species of flora and fauna. According to the United Nations, the population of the world passed the six and a half billion figure in 2006. It is anticipated that it will reach seven billion by the year 2012. It is increasing at a rate of 80 million a year and is likely to continue to do so at least until 2015. It is estimated that to stabilise the population would require a world fertility rate of 1 or slightly less. Fertility rates refer to the number of children born to each woman in the community. Some of the developed countries have reached this level or are moving close to it, but the more populous developing countries have fertility rates of five or more. They include India, Indonesia, Pakistan, Iran, Nigeria and many other African countries. China has been attempting to control fertility for some years but because of its huge population it continues to add significantly to the annual increase. 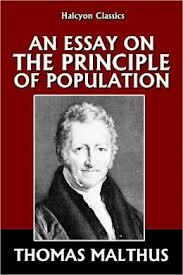 Malthus showed that poor populations had high fertility rates and correspondingly high mortality rates. This was true 200 years ago but, while poor countries still have high fertility rates, their mortality rates have shown a significant fall because of modern public health measures controlling some of the epidemic diseases. The rapid increase in population in the African countries is at the basis of the failure to counteract poverty, despite the billions of charitable and aid money which has been sent to that continent in recent years. With the changes in the world already showing tangible evidence of a serious imbalance between humanity and Nature, with the gradual depletion of the planet’s resources, with the continuing increase in world population and the persistence of poverty in so many countries, can we continue in our ways and still ensure the wellbeing of future generations? Can we claim to be fulfilling our obligations to care for our planet and for Nature? I wrote the above paragaphs in 2007, 22 years after I had read the first Malthus publication of 1798. I was aware of the population issue as early as 1968 having read and being influenced by the publication Population Bomb published by Paul and Anne Ehrlich in the United States.